Now they're showing multi-user support. ARKit2 seems limited to 4 users at a time. Now they're zooming into the inside of the building as well. They've put Batman in front of the Bank. They're taking another character to the bakery because he's hungry. This is kind of SIMS like? OH NO! The building caught fire in Augmented Reality! They've brought in a fire truck to put it out, and a helicopter to rescue clowns off the rooftop. And doing this unlocked a new vehicle model in AR. With ARKit 2 they can save the entire world into the physical set and pick up where they left off next time they play. With a single LEGO kit and ARKit 2, they have huge creative play possibilities. Photos. Over a trillion photos are captured on iPhone each year. Photos is the best way to relive and share those moments. This year, we're making it even better, and it starts with Search. You've been able to search the library in the past. Now, Search starts before you search with Search Suggestions. Key moments, categories of photos, and places searched by business name are now possible. It indexes 4 million events by time and place, so you can search for those event names, and it will find them. Multiple search terms, and suggestions for additional terms are possible and in iOS12, we have a new tab, "For You" - which has all your memories, featured photos, and effects suggestions. We also highlight your shared album activity. Our focus is on sharing great photos with those who matter most. For You will recommend a set of photos you might want to share, and recommends who you might want to share it with based on the people who were in the photo. They're shared at full resolution and their phone searches photos from their photo library of the same event and suggests to share them back to you. This is built around iMessage, end to end encryption, and on-device machine learning. Siri. "Siri is by far the world's most used assistant, with more than 10 million requests processed per month." Siri works with many third party apps, but we want to make Siri do much more for you. We're doing that by making Siri take advantage of the power of Apps. "Shortcuts" allows apps to take advantage of adding a shortcut, your own phrase, to Siri. When you say that shortcut phrase, it will activate the app and do what you'd wanted to do - "Gametime" to get a game time from teamsnap, or "ring my tile" to open Tile, and begin ringing it. Shortcuts lets Siri do more. If you ordered a coffee from Phil's every morning before work, Siri can suggest it in the morning and take you directly to the app. In Search, Siri will suggest you text the meeting organizer. At a movie, Siri will suggest turning on silent mode. "We want to let you as users create your own Shortcuts across multiple apps. And we're doing it with a new app, the Shortcuts app." This looks a lot like Workflow. Kim Beverett comes to the stage to talk about the Shortcuts app. It's the morning, I pick up my phone, it's a suggestion from Phil's Coffee. Siri has learned I do this every morning, so now Siri has learned to let me do this directly from the lock screen. Later, I'm sitting at my desk, I open the Up Next widget, and Siri Shortcuts offers to call into the meeting or let the organizer know I'm running late. Beverett opens Kayak, has a flight, hotel, all the details. She wants to use it with voice on the go. She taps Add to Siri, records a custom phrase "travel plans" and when she lands at the airport and says "travel plans" siri will read to her the address for the hotel from Kayak. Back at work, she taps Shortcuts, where there's hundreds of templates. In Library, she has Heading Home workflow, where it tells her the travel time to home, sets her homekit thermostat to the right temperature, plays the KQED radio, and more. Whenever she leaves work, she says "Heading Home" to Siri, and it does all the steps in workflow. Siri Shortcuts feels huge. They run from iPhone, iPad, and can be issued from HomePod and Apple Watch. Susan (last name? Craig didn't say) comes out to talk about News. News is a personalized feed of all the stories you want to read pulled together from trusted sources. With the new browse tab, you can discover new channels and topics, and made it easier to jump to favorites. News shines on iPad. We've added a new sidebar to make it easy to dig into the areas you're most interested in. We've completely rebuilt the stocks app. With the added spark lines, those little charts show the stock performance througout the day. We're bringing Apple News to Stocks. The top stories in stocks feature business news, curated by the Apple News editors. Tap on any stock to get an interactive chart with after hours pricing and relevant headlines. Tap on a headline, you see the full article without leaving Stocks. With iOS 12, we're bringing Stocks to iPad. We take advantage of the larger display to keep stock prices on the left with news on the right. Voice Memos: we've rebuilt voice memos and are bringing Voice Memos to iPad for the first time. We've added iCloud support so your recordings stay in sync across all devices. We think iBooks is the best way to discover ebooks and audio books. With iOS 12 we're updating it with a new interface, and renaming it Apple Books. Reading Now is a feature that makes it easy to pick up reading right where you left off. There's a stunning new store that makes it easier than ever to browse through your books. We also have a smart and safe way to use your apps in the car. CarPlay supports third party calling and messaging apps. 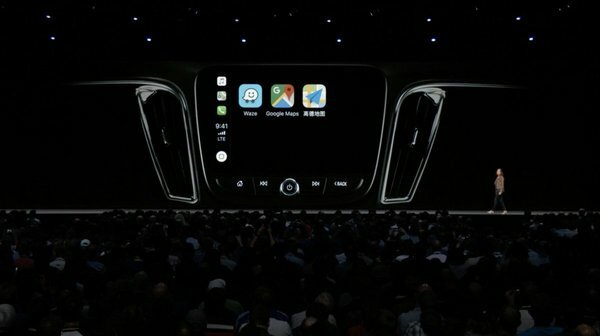 With iOS12 CarPlay supports third party navigation apps! Google Maps, Waze are on the screen. Craig is now talking about device addiction and how much time people spend on device. "We're announcing a set of comprehensive devices built in to help you limit distractions abnd balance your time spend on device." Maybe you wake up at night and have a barrage of notifications and it wakes you up and gets you spun up. We're introducing Do Not Disturb during Bedtime. Do Not Disturb can help parental distractions - there's automatic ending times to it from Control Center. Notifications are getting attention, too. Instant Tuning lets you press into a notification and you can decide if you turn off notifications for apps you aren't using, or have them go to notification center without going to the lock screen. Also, Apple is adding support for grouped notifications. Grouped by app, topic, and thread, giving you an overview of them, and with a single swipe, you can triage a whole group of notifications away. Screentime empowers you with insight and control over how you spend your time. Every week, you get a Weekly Activity Summary showing you detailed reports on how much time you spend, where you spend it, and how the use breaks down during your day or night. Which apps, how often you pick up the phone, and which apps send the most notifications. This gives you the power to decide how much you spend with your device every day. For people who need help, they've created Screen Time which lets you set limits on how much you spend in apps. This is in sync on iPhone and iPad, so limits apply to total usage. We think this will be helpful for some people, but especially kids. Kids get a report on their own, but as a parent, you get a report, too, and can create allowances. You can create downtime, or limit by time, or usage. For some apps, you can make them always available (phone, education apps) and limit based on content and age appropriacy. This uses Family Sharing, so it's super easy to set up and manage from the parental device. Screen Time has great features to help you manage your time. Messages has given us fun ways to express ourselves with emoji and anomoji. Animoji now do tongue detection. This is the CarPlay display showing Google, Waze and others, from a few minutes ago. 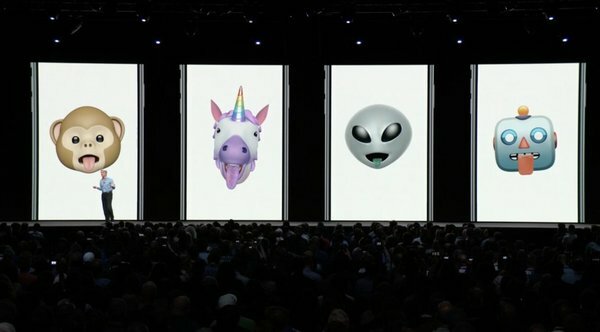 Craig is showing Memeoji, animoji avatars that can look like you. This is like Nintendo Mii, except fun to create. Kelsey Peterson is out to demonstrate them. There's a new tiger animoji, which Peterson identifies as female - "she's so cute". There's also a koala, a t-rex, and a ghost that looks a lot like the ghost emoji. Swiping right lets her create her very own meme-oji. Select skin color, add freckles, hairstyle, color, head shape, eye color, brows, nose & lips, earrings, eyewear... and with each change, it live updates, while animated. This seems super simple. There are all sorts of new effects filters. You can put a sticker from a sticker pack on an animoji, and apply it live as a photo in messages. "you'll be able to facetime up to 32 simultaneous group participants." Cheers! FaceTime is now integrated into messages. 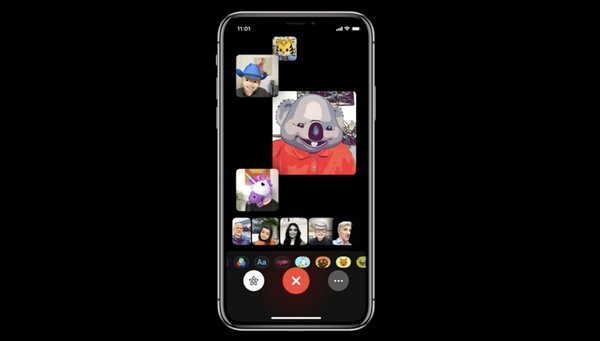 You can go from a group chat to a group FaceTime and members can join or drop out at any time. Craig demos a call with the FaceTime team. they're already on a group call, and he's joining in. People are on tiles, and at the bottom is the "roster" containing everyone else on the call. "Craig, am I on the big screen?" "Yes, Lauren, this is not a test, you're in front of 6000 of your biggest new fans!" When Lauren speaks, her tile comes forward and gets bigger. Double tapping brings a person front and center. The animoji, sticker packs, meme-oji packs are available here tool. Tim is back out on stage. "iOS 12 is fantastic and we can't wait for everyone to get their hands on it." "Apple Watch is number 1 in customer satisfaction, and not just this year, but every single year since we launched in 2015. Growth has been off the charts. Apple Watch grew 60% last year. We're constantly hearing from customers about the many ways Apple Watch has changed their lives." Tim shares a story about how a husband and wife were boating, when her husband's muscles, due to a medical condition, went limp and fell into the water. As she was holding him in the icy water, she used Apple Watch to call for help, and believes without Apple Watch, her husband wouldn't be with her today. "We're excited to introduce WatchOS 5 today, which brings even more ways to stay active and connected." Kevin Lynch comes out to talk about WatchOS 5. We're excited to bring more enhancements to Workouts. Yoga. Yoga works primarily with heartrate, and you can now track yoga workouts. Hiking takes into account heart rate, elevation and pace. Outdoor run is even better for training. You can track rolling mile pace, and cadence, so you can see current steps per minute. To solve when you start working out without starting it on watch, we're adding automatic workout detection. If you press start some time after, you get retroactive credit for the workouts you've done. You also get end alerts if you forget to stop the workout. All of these help you track activity better and stay motivated. Apple wants you to stay in the moment, but also stay connected to the people that matter to you. Adding cellular to Apple Watch was a big part of that. In WatchOS5, you have a new way to communicate: realtime voice, but with the spontaneity of text. Introducing: Walkie-Talkie, a new app for Apple Watch, a fun and easy way to talk with friends. You choose a contact, they get a one time request, and if they accept you can just press to talk, and they hear you... just like a walkie-talkie. This watch-to-watch connection works on cellular and Wi-Fi. We're making some great enhancements to the Siri Watch Face for Sports, Maps, and Heart Rate. 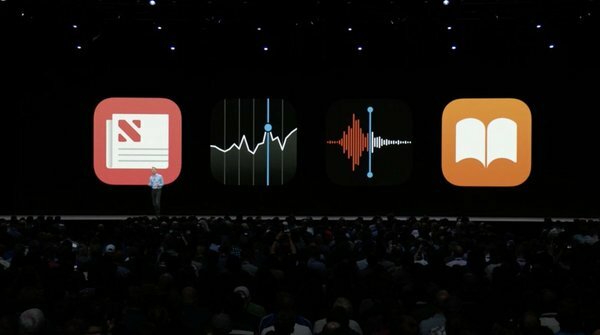 We're also adding Siri Shortcuts, from iOS 12. Predicted Shortcuts, right on the watch face. These shortcuts appear based on whether you do them typically at those times. You can now use third party app content on the Siri watch face. If you go running with Nike+ run club, or log meals with LoseIt, raise your wrist and tap, and you have them even easier than ever.